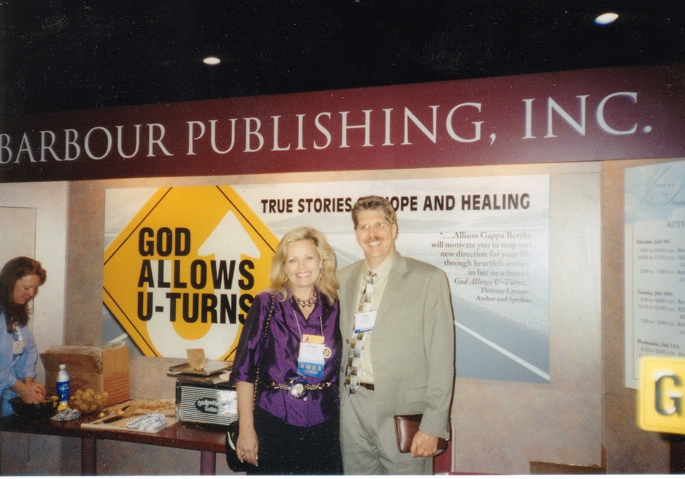 Here I am at a CBA annual convention in 2002 with Greg Buick, the (former) Vice President of Barbour Publishing’s Promise Press imprint. There are 710 God Allows U-Turns Authors in 13 Volumes! 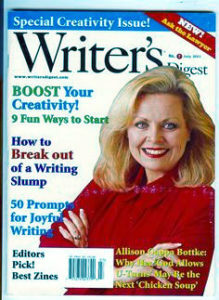 With a surprise 2001 cover story feature in Writer’s Digest Magazine (calling us the next “Chicken Soup,”) a major publicity campaign launched by Barbour Publishing, and a serious website presence, we hit the ground running. A second cover story feature appeared in BOND Magazine, followed by a whirlwind of radio and TV interviews. We received literally tens of thousands of submissions over the course of time that we were accepting true short stories for the God Allows U-Turns series. There were many months when over one thousand new stories would fill our email in box. Stories came from established, well-known authors, as well as from many first-time authors. It was an honor and a blessing to publish the powerful true stories of hope and healing from 710 authors in 13 volumes from 2001 to 2006. Although most of the U-Turns books are now sadly out of print, you can still find them online at Amazon from time to time, and occasionally at Half Price Book stores nationwide. We have digital eBooks available of the first four volumes and will be offering these as free gifts on Facebook, as Flash Give-aways, and also as incentives when you join our Private Online Membership Only Groups for writers and readers. 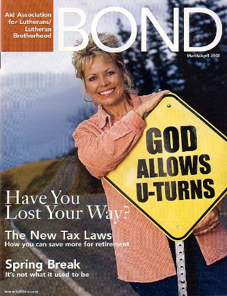 ATTENTION GOD ALLOWS U-TURNS AUTHORS: Scroll through the list below to see new and familiar names—and if you are one of our family of God Allows U-Turns authors, please take a moment to visit Facebook and post a comment about your U-Turns experience. And make sure to “Like” my Facebook Author Page so you’ll receive notices of Flash Giveaways and special author events and interviews. Also, be sure to subscribe to my SANITY Support Newsletter for updates about U-Turn Author Reunions and special online events featuring interviews with our family of contributors. Sandra J. Campbell Who’s The Mama Now? Richard Bauman Does God Move Away From Us? Delores Christian Liesner Surprise Us for Dinner, God! Susan Lynn (aka) Can Jesus See? Merrie Maurer/Root Dear Mr. B.
Sandy Sheppard Are You Sitting Down? Lanita Bradley Boyd What Was I Supposed to Be? Leone A. Browning Honey, Will You Come Here? Kathryn K. Howard Mr. J.
Linda LaMar Jewell Press On! Wendy Dellinger Do You Trust Me? Sandra McGarrity What Does Anna Need? Jeanne Pallos Mom, I’m Moving Out! Kriss Erickson Why Now, Lord? We’ve got some exciting opportunities coming up for members of our God Allows U-Turns family of contributing authors. Make sure to Subscribe to my SANITY Support Newsletter and visit my Facebook Author Page to check in with us!